The third installment in my series on microwineries features Alan Baker and Serena Lourie of Cartograph Wines, perfect examples to illustrate the path to making wine is rarely a straight and simple journey. Cheers to another great wine story! Surrounded by the silent woods on a lake in northern Wisconsin, Alan Baker opened a bottle of 1998 Riesling from the Alsace region of France, a wine that had traveled well over 4,500 miles to be poured. Alan still remembers the wine’s flavor as a “cacophony of citrus blossom, pear, black tea, and petrol.” He was also acutely aware of how much that one wine “engaged his senses.” It spoke to him and intrigued him. His official wine journey had started. At this time, Alan was working in Minnesota Public Radio, after being a vocal music major in college. His radio job found him working with many orchestras and composers, including two projects that earned Alan prestigious awards. Though he found much gratification and success in this work, he still was nagged by the fact that wine needed to be a part of his future. In 2005, he changed courses by selling his home in Minnesota and moving to Healdsburg, California. He was able to take this step after meshing his radio career with the wine career he was trying to pursue. As a way to finance his interest in wine and get hands-on learning, he created cellarrat.org. Part of his web site was a blog while the other part was a podcast, a then-new concept. Alan’s goal was to offer his services as a “cellar rat” to wineries. In addition to the work, Alan gave publicity through his blog and podcast. Sonoma producers Peterson and Unti were first to give Alan a chance. Alan never expected to make a great deal of money on this leg of his journey; he just wanted to learn everything he could about the industry. He was still so good at his public radio job that NPR picked up the podcast, which turned into a lucky break for his wine-making career. At this point, Alan knew he wanted to make wine full time; however, he could no longer do both radio and wine. He would have to commit to one completely. He took yet another giant leap and asked his online audience for help. His supporters purchased wine futures, basically paying for his first vintage of wine before it was made, enabling the production to be completed. Alan used this early form of crowd sourcing to produce his first vintage at Crushpad. About 100 of those who purchased futures—called The Rat Pack—helped do cellar work to make the vintage, all documented in a video podcast called Pinot 2.0. The Cellar Rat Cellars label production was 100 cases of Wentzel Vineyard’s pinot noir. Immediately following, Alan became the director of Crushnet, a web site that virtualized “the winemaking process so anyone across the globe could create their own customized barrel of wine.” This kept him at Crushpad for three years and introduced him to another wine lover, a meeting that would forever change his course. Serena Lourie’s wine journey started an ocean away, as a child in France. Having a grandmother that lived in Brittany, Serena’s family spent four months every year there. Serena’s French experience with food and wine would follow her home and to adulthood. In Washington D.C., Serena found her interests in health care, specifically adolescent psychiatry, a field in which she worked for fifteen years. At 18, her first job was in an adolescent unit. She finished her degree at Georgetown, then later went on to get an MBA. This led her to be in charge of programs for teenagers, often creating these programs herself. D.C. was also home to Serena’s wine aha! moment. At a table of friends overlooking the beautiful city harbor, she ordered a bottle of Shafer Cabernet from Napa to celebrate her graduation. The taste and smell was amazing, but she still recollects how the finish lasted two full minutes—an amazing wine. The ultimate irony came years later when a Napa cab was the first wine she made. In order to take a break from her high-stress job, Serena traveled cross country to Crushpad, getting her hands dirty while enjoying her wine passion. She and Alan found themselves working together and noticed all they had in common: a zest for life, a love for wine, and a palate for pinot noir. After a long day of wine work in 2009, Alan and Serena mapped out their plan to launch a label together, focusing on Russian River Valley Pinot Noir. They knew they wanted their wines to tell a story—not just any story—but the story of the paths they took to end up in Healdsburg making wine. Cartograph’s primary focus is pinot noir; it is the reason they produce in the heart of Sonoma and from the Russian River Valley. Alan and Serena both love the versatility of these wines. They also love the challenge of producing wines from such a finicky—and prestigious—grape. 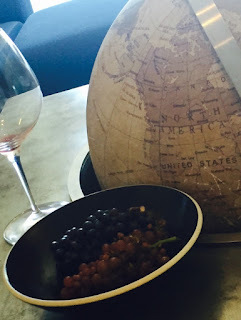 Cartograph’s pinot noirs are wonderful works. The Mariah Vineyard (my personal favorite because my sister’s name is Mariah) is wonderfully delicate and complex. The Choate Vineyard and Perli Vineyard are also excellent examples of terroir-driven wines. The Russian River Valley pinot is yet another quality wine. It shouldn’t be a surprise that Cartograph also makes an amazing riesling. In true Alsatian style, the wine is bone dry and elegant with a hint of petrol and wet rock, a wine both novices and experts will enjoy. A sangiovese from Upton Vineyard (my husband’s hometown name) brings the Cartograph story back to the beginning, as the first wine Alan and Serena made together at Crushpad was from sangiovese grapes. The journey of a thousand miles literally started in different locations for Alan and Serena. Their lives were on a direct course to collide, over the most exceptional of topics—wine. Together, they have traveled far and wide on a winding path to get to where they are today: making beautiful wines in a beautiful place. See another great look at Cartograph Wine's story by watching American Wine Story.